A lost incarnation AND a new vision for the show going forward? The newer incarnation of Doctor Who has largely experimented with a kind of hybrid approach, with a loose story arc overreaching throughout each season that all builds up the finale, while individual episodes therein are standalone adventures, by and large. With the 50th anniversary coming up, however, everyone knew that something big had to happen. What better way than to assault the very status quo that the entire revived series had been set up on? At the core of new Who has been one idea: that the Doctor fought in the Time War, and is the last of his kind as a result. “Day of the Doctor” focused squarely on this idea, and flipped what we thought we knew about the Time War on its head. It turns out there was a lost incarnation of the Doctor, the so-called “War Doctor,” who primarily fought in it, and has been forgotten by the later incarnations as a means of disapproval over the decisions he made. Over the course of the episode, the War Doctor is brought back into the fold, so to speak; the other doctors, Ten and Eleven, reaffirm his choice; the decision we thought was made is undone (!) and Gallifrey, the Doctor’s homeworld, is saved… but still lost in time and space. The show’s entire premise is shifted as a result. No longer is the Doctor the last Time Lord, but instead, he’s a man apart from his people and seeking to save them. He has a goal to work towards now. 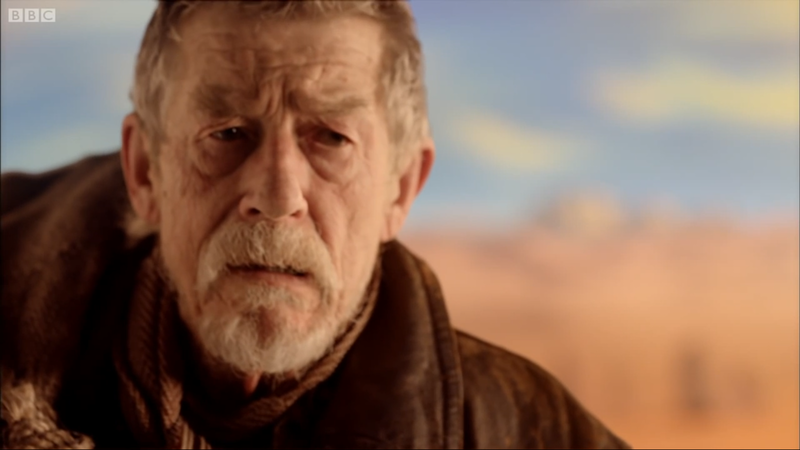 And the burdens of his War Doctor persona have been lifted, freeing the character from the one thing that had shaped him through the last 7 seasons and 3 incarnations. Series 8 had a pretty large shift in tone and style as a result of all this, and it’s only the beginning. And Crichton being Crichton, he of course tries to resolve this with Rock-Paper-Scissors. 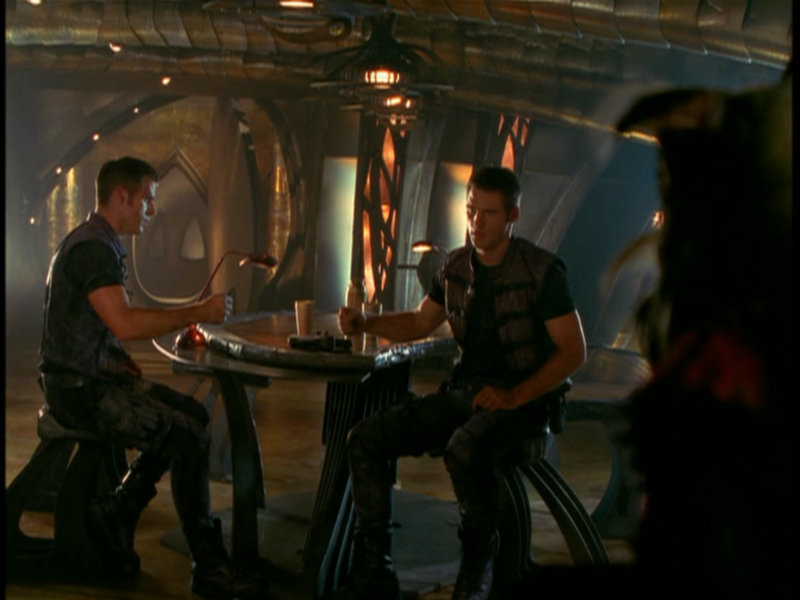 Well, Farscape almost does that. The only problem is… both of the Crichtons survive. 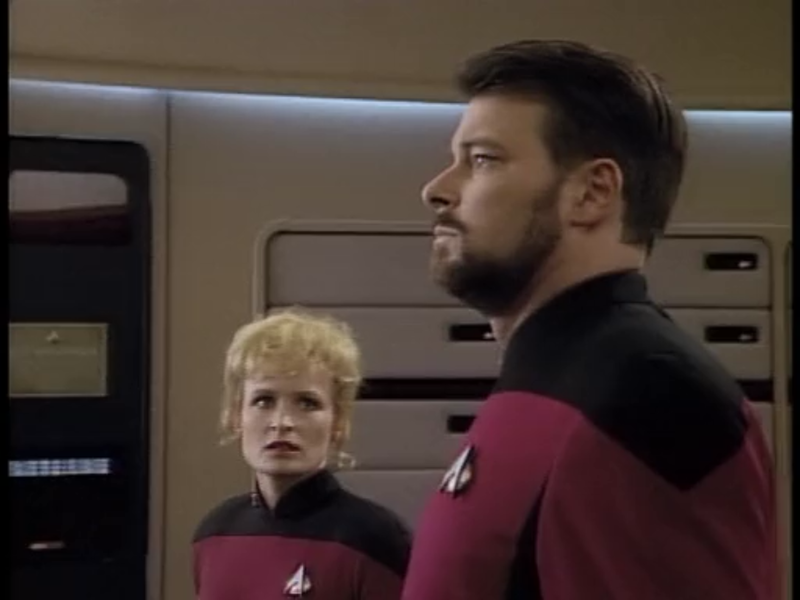 And this does not go away, as there are two Crichtons for a preposterously huge number of episodes after this point, which was mostly dealt with by splitting the crew into two and sending one Crichton off with each. This has huge implications for the entire series moving forward, and with Crichton and Aeryn’s relationship in particular. While we eventually get down to one Crichton on the show again, the consequences don’t go away. 2. 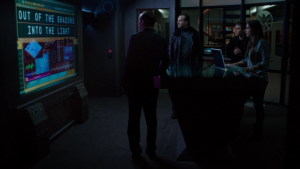 “Turn, Turn, Turn”–Agents of S.H.I.E.L.D. If you’re one of my readers who checks in on the reviews regularly, I’m sure you know all about this one. Agents of S.H.I.E.L.D. had garnered a lot of criticism in the first half of the season for being too episodic and behind the times, often feeling like a 90’s show in terms of storytelling. It wasn’t until this episode, which had to pick up the pieces after Captain America: The Winter Soldier, that we started to understand why. The entire organization of SHIELD is destroyed in that movie, and with it, the premise of the show is reduced to rubble as well. The show had to spin its wheels on episodic stuff to start out with, because they were waiting to have the rug pulled out from under them. This was honestly one of the best things that could happen to the show. While we all love Coulson, SHIELD was starting to look a little nefarious in The Avengers in their willingness to bomb New York, and the beginning of the first season of the show just kept showing us how huge and Big Brother-y SHIELD actually was. Skye would call attention to it from time to time, but it’d be brushed aside, and that never sat well with me. By destroying SHIELD’s capacity to behave that way, it put our heroes more firmly on the side of the good guys. And beyond that, it had more direct consequences: Ward’s betrayal and subsequent rejuvenation of his character, the new enemy of HYDRA appeared, and the now-ragtag organization was completely in the scope of the show, eventually placing Coulson in the Director’s position. And we know now how well these changes turned out for season 2. The main character has been corrupted by the enemy… and they have just kicked the good guys’ asses for the first time in YEARS. If you were to travel back in time, you’d never be able to convince people how significant this two-part episode turned out to be. It was one of the most popular and influential season finales of all time, with rumors flying around between seasons about what would become of Picard, and yet that still doesn’t even begin to show how it affected Star Trek as a franchise. The Borg had been seen before this episode, of course, but this is where it became apparent just how fucked the otherwise-incredibly-powerful Federation would be in a full on invasion. This served as the basis for the second TNG film, First Contact, which itself was by far the most popular of the TNG-era films. The Battle of Wolf 359, of which we only see the devastating after effects of in the episode, becomes a pivotal moment in Star Trek history. The first episode of Deep Space 9 uses Wolf 359 as a tragic backstory for Sisko, and led to the development of the Defiant; Voyager encounters several Borg who were assimilated in that battle, and the popularity of the Borg in this episode is one reason why Voyager ended up relying on them so heavily in later seasons. It led to immediate consequences in the next episode, “Brothers,” which has Picard going home and breaking down over what’s been done to him, something that was almost unheard of at the time. 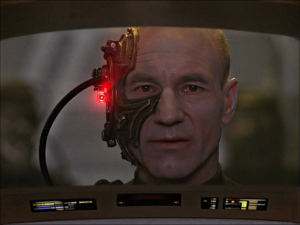 And within TNG, it’s never really forgotten, even once the status quo has seemingly been restored; Picard’s encounter with the Borg drone Hugh shows that it still deeply affects him, and of course it came raging back to the surface in First Contact. Suffice it to say, when it comes to shaking up the status quo of a massive franchise, it’s hard to go bigger than this. That’s our Friday Four for this week. Are there any episodes that ripped apart the status quo of other series that you think are worth mentioning? Or maybe you’re not entirely convinced that these were as groundshaking as I felt they were? Let me know in the comments, or on Twitter @RetroPhaseShift. Tonight, Defiance returns with a 2-part premiere, and the review for that will be up… sometime. Possibly Monday. I haven’t decided how to spread these updates out over the week yet. Couldn’t have been on a Tuesday like SHIELD, could you, Defiance? if you werent limited to the “friday four” framework, what else would you have added? With the list as it is, the main one I didn’t include that I could have was the Battle of Antarctica in SG-1, which not only allowed for the discovery of the Antarctic outpost but setup the spinoff and provided the background for Cameron Mitchell when he eventually showed up. It’s kind of like Stargate’s version of Wolf 359, in that way. 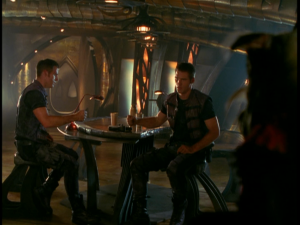 A show where upsetting the status quo ended up being a bad thing would be Andromeda, where the fifth season premiere finds the ship rendered useless, the crew scattered, Rommie’s role cut down to almost nothing, and all the sets replaced with boring identical desert planets. It pretty much ruined everything I had liked about the show beforehand. Often times I have a little difficulty coming up with 4 things, but this is one where I could’ve done a lot more, especially if I expanded it to heavily serialized shows like BSG (New Caprica arc) or Babylon 5 (similar to Andromeda in that it’s a whole season of change). Maybe that’s for another day, though. those are good ones too. yeah theres a difference between a season long arc and a game changing episode which makes the show quite different going forward. one that comes to mind for me is Dollhouse. partway through season one it switches from a “job of the week” format to a very whedon big plot that lasts through the end of the series. the dvd exclusive episode (epitaph one) also, although that doesnt really impact the world until the finale.